You’ve got your game. You’ve got your snacks. You’ve got your friends. You’ve got your gaming fingers ready. And you go to sit down on … the floor. Or worse, a stiff uncomfortable chair that kills your back after five minutes. If you’re serious about your gaming, it’s vital that you have a comfortable gaming chair to do it in. That’s why today we’re introducing you to the Cadillac of gaming chairs: The X-Rocker 51396. A high-tech control panel. Total sound immersion. Player-to-player interaction. Plush arm rests. It even tilts and swivels. And did we mention wireless audio? Sounds like a dream, right? If this sounds like the type of seating arrangement you’d like to have during your next gaming session, read on to see why we think it’s the comfiest one on the market. One element that brings video games to life is rich, clear audio. Normally, you’re limited to the audio emitted from your console, but with the X-Rocker 51396, you’re actually a part of the sound experience. What does that mean, exactly? It means that with two speakers in the headrest and a built-in subwoofer in the back, you’re closer than ever to the sounds that bring your favorite video games to life. The system powering this audio innovation? Ace Bayou’s innovative Audio Force Modulation Technology (AFMT). Working in much the same way that a separate, adjustable powered subwoofer would, AFMT incorporates sound vibrations into the chair itself. Through its unique design, the technology leverages the space inside of the chair to boost sound quality and provide total media immersion. 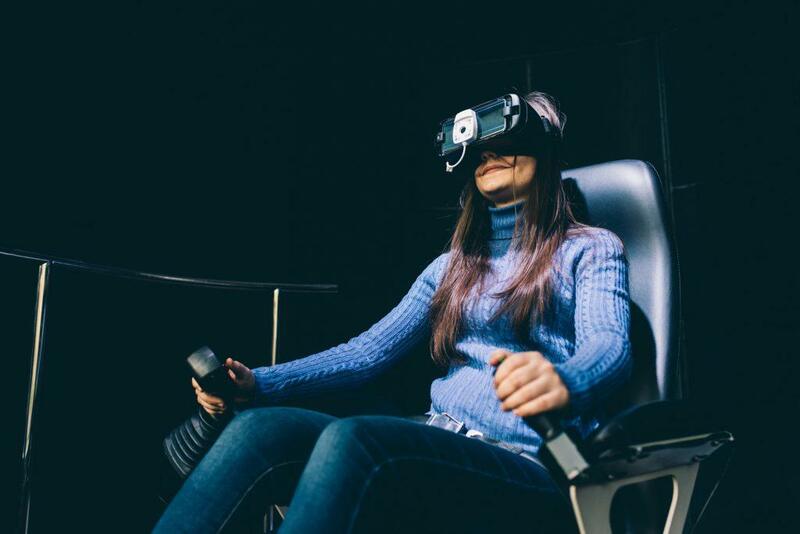 Depending on how you adjust the volume settings, you’ll feel a range of vibrating motion that takes the interactive video game experience to the next level. So leave your headphones in the drawer and settle in. Not only is the X-Rocker 51396 the most comfortable gaming chair on the market, it’s also one of the smartest. Ready to switch from your Xbox to a game played on your Nintendo? Or maybe someone else wants to use the chair after you, and is planning to pop in a different game. Go ahead and switch your consoles, but you don’t have to switch out of this comfortable gaming chair. One thing that makes the X-Rocker 51396 so enjoyable and comfortable is that it accommodates multiple consoles, including Nintendo, PlayStation, Gameboy, Wii, and Xbox. The Xbox compatibility is especially important to note, as not all gaming chairs on the market have a high-functioning Xbox connection. It also hooks up to LCD and plasma televisions, as well as multiple stereo systems, so even if you just want to sit and listen to music or recline it to watch your favorite show, you’re sure to have the most dynamic experience possible. Comfort and convenience go hand-in-hand, and when you’re in the middle of a gaming spree, a chair that performs the same way, for every game, is critical. The main reason we’ve deemed the X-Rocker 51396 the most comfortable gaming chair? It’s designed in a way that allows it to hold up to hours and hours of intense gaming. If you’ve ever sat up from playing and felt the tension in your back and neck, you know how much of a difference a quality chair can make. It shouldn’t just be comfortable to sink into — it must optimally support and position your body’s weight and shape. Research reveals that many video gamers, especially young people, can suffer from poor posture due to improper position. This is primarily because much gaming takes place wherever it’s convenient, with little regard is given to the long-term effects that each playing area can cause. The good news is that a majority of these issues can be prevented, and even reversed, by simply employing a more ergonomic workstation, like the X-Rocker 51396. Put simply, ergonomics is the practice of designing spaces, systems, processes, and products around the people who use them. It’s using the human body as a guide to make workspaces, homes, hobby spaces, and more efficient and healthy for those who inhabit them. While this science is applied in various fields, from the health industry to corporate offices, it’s equally applicable to the gaming world. An ergonomically designed, comfortable gaming chair is one that is carefully designed to specifically support the user. It takes into account muscle movement, weight shift patterns, degrees of tilt, and more. The X-Rocker 51396 is such a chair. With a plush headrest, round pedestal base that keeps you elevated, and padded, gunstock arms that allow a natural arm height and position, the chair’s design helps to keep your body in prime playing position. This helps prevent pressure and tension from building in your joints, even after you sit for a long period of time. Another important design feature is the chair’s tilting and swirl capability. A majority of video games require player movement, even if it’s just a slight tilt to the left or right. Performing this function in a normal, straight-back chair is uncomfortable the first time, and can result in incredible muscle stress after only a few times. Even some gaming chairs can lack the full range of tilting and swirling motion required by many of today’s games. To this end, the X-Rocker 51396 is not only a comfortable gaming chair — it’s functional, helping ensure that any time your game requires you to shift position, you’re more than able to respond. Your children, friends, and other family members can also take advantage of the chair’s features. Designed to support both adults and children of varying heights, the X-Rocker 51396 is an all-in-one gaming chair built for the entire family. Gone are the days of oversized bulky control panels that take more attention to function than the game itself. Rather, the X-Rocker 51396 features a sleek, built-in control panel right on the side that lets you control your gaming experience right from where you sit. Separate volume and bass controls allow you to adjust the sound to the perfect setting, with a smooth, clickless volume wheel that gives you full and precise control. In addition, input/output jacks make audio source connections breeze. Those same jacks can also be used to hook up other X-Rockers, to elevate and enrich your multi-player gaming experience. When used this way, two or more players in close vicinity can share in the gaming experience together, expanding the potential for use. This comfortable gaming chair also includes an integrated radio wireless receiver and comes shipped with a wireless transmitter. This system allows any source with RCA stereo outputs to send audio straight to your chair. You’ll also get optional RCA cables to use if desired. Now, you don’t have to worry about organizing, connecting, and walking around a tangled mess of wires. There’s also no worry about wires splitting or becoming lost. With advanced wireless technology, you can connect and control in a breeze. At this point you might be thinking, all of these features sound really cool, but there must be a catch. This chair must be a pain to assemble, with a million tiny pieces, right? Or maybe it weighs a ton and is difficult to move around? Actually, the X-Rocker 51396 couldn’t be easier to set up, transport, and store. The chair comes almost totally assembled, and within 10 minutes’ worth of simple install, it’s ready to use. It also comes with a user-friendly instruction manual and at less than 55 pounds, it can easily be transported anywhere around your home. It can even be folded for easy storage when it’s not in use. Another bonus? The chair is readily purchased through many top online retailers, including Amazon, and many offer a discount off the list price. So now you can shop for your new comfortable gaming chair, all from the comfort of your home recliner. While that last feature might not be directly related to how comfy the chair is, a budget-friendly and economical gaming chair that also breaks the mold in feature and design is one we’re more than comfortable with. With so many options available in the gaming world, including which console system to use, which games to buy, and which strategies to pursue, it can be hard to find a single thing that almost all gamers deem universally important. Yet, we’d venture to bet that a comfortable gaming chair is pretty high on the list of gaming priorities. It’s high on ours. If you’ve read about the X-Rocker 51396 and think it might be the perfect gaming chair for you, great! We’d love to help lead you on the journey to purchase by informing you of the top gaming chairs available, where to find them, and how to compare to make sure you’re getting the best value for your buck. 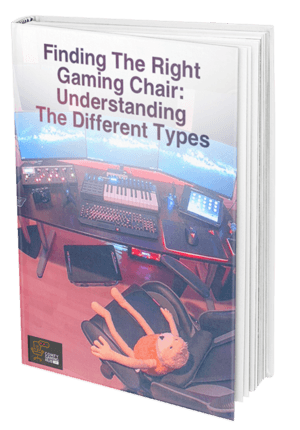 Feel free to contact us, browse our handy buying guide to compare key attributes of the market’s top gaming chairs, and be sure to check out our Chairs 101 feature to choose the chair that’s best for you. Then, let the games begin!